Yesterday our nursery production class visited the Inch Nursery, where all of the bedding plants used to decorate the city of Edinburgh are grown. 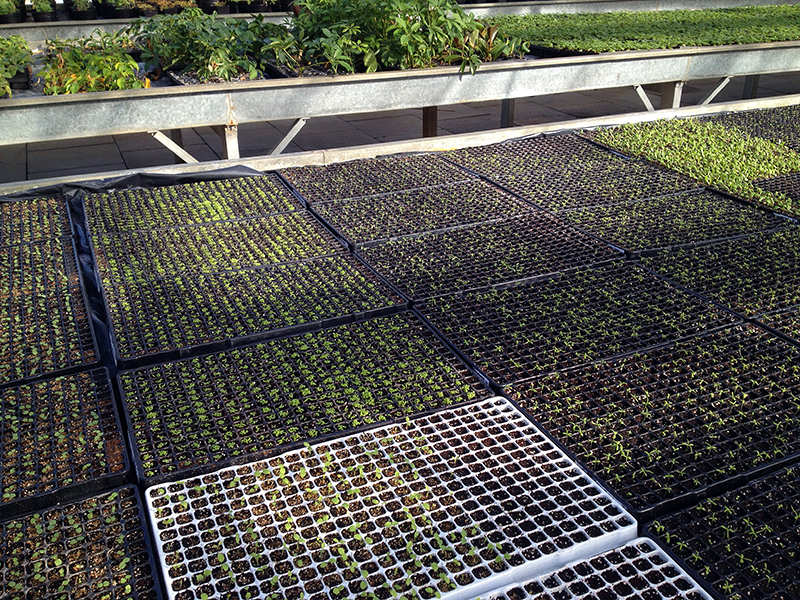 I was really struck by the huge nursery tables filled with seed-starting trays. 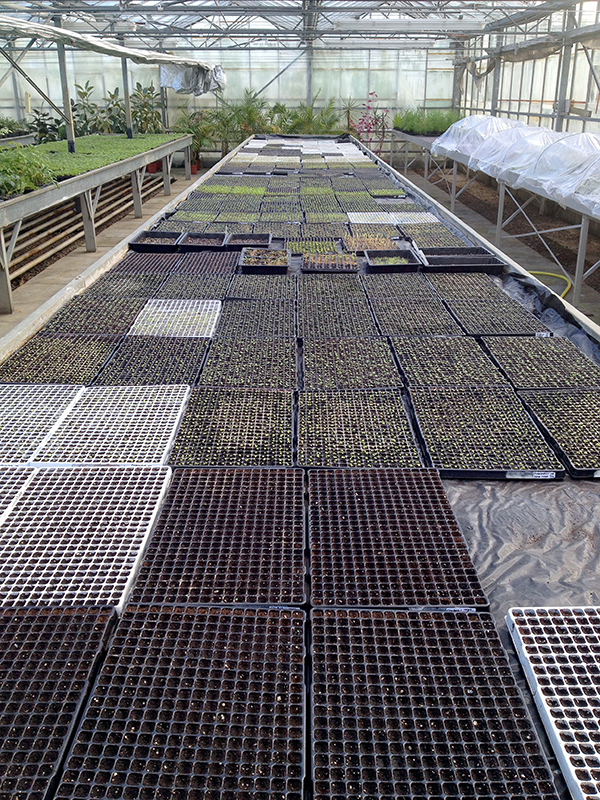 Each module is no bigger than a centimeter squared and yet every one held a tiny growing seedling just a millimeter or two tall. These are the beginnings of new life, and I stood in front of all that potential and felt like there’s so much to look forward to with the coming of this spring. My classmates and I spent the afternoon potting up thousands of bedding geraniums, standing and chatting and laughing at a long bench full of compost. It’s mindless work, and essential to do quickly and efficiently. But it’s lovely to get lost in the feeling of compost under my hands. Scoop, dangle a young plant over the pot, one scoop, two scoop, tap the pot once on the counter and on to the next. It’s a flow activity if ever there was one. I am not sure bedding geraniums are anyone’s favorite plant, but these are destined to bring bright color to what the Rough Guide just the other week voted the fourth most beautiful city on the world. That I had anything to do with making something pretty for millions of people to see is entirely satisfying, especially when that something pretty began life as a dry little speck shoved under compost, with hope. And also with shovelfuls of hope, here’s a little shout-out to the person who at 7 this morning gave me the best news I’ve had in months. So happy and excited for new adventures in our future, couldn’t stop grinning all day. XOXOXOXOXO!!! Hi. I was visiting the Botanic today and wondered if you were working in the grounds. Such a beautiful sunny day for lunch with friends and a walk to see what’s in bloom and where buds are starting to grow.I hope your course is going well. Have you heard about the Patrick Geddes gardens in Edinburgh? It’s so interesting to see the hidden gardens just off the Royal Mile. Hi, Carol. Thanks for visiting. 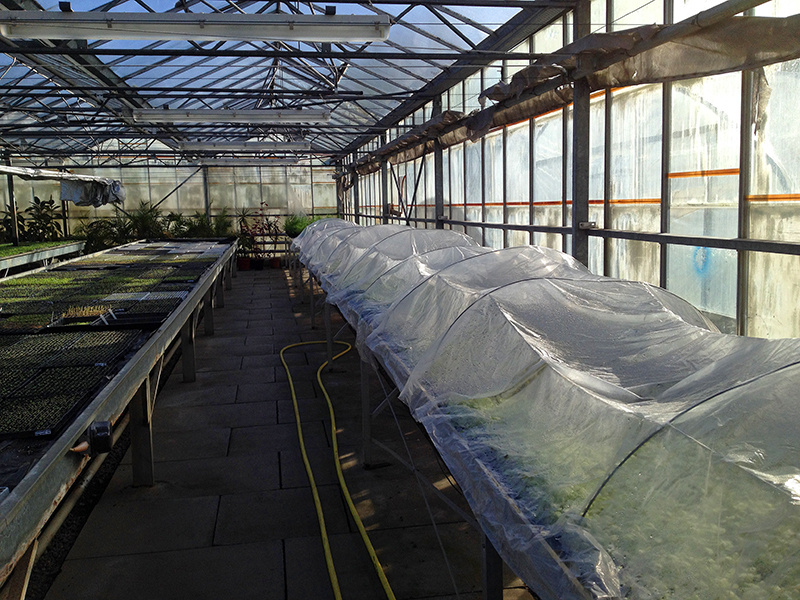 No, not at work today–out plant collecting instead. Thanks for the great garden tip! You are currently reading Hopeful at Bonafide Farm.